Everything can be done with a 555. It’s a universal law, as all readers know. And a flashing light, you might think, will have been done before many times. But nobody has ever created a 555 flashing light as small as thie one created by [TWires], who has taken a TI LMC555 chip-scale packaged 555 and dead-bugged a working flasher on its surface using 01005 discrete components. There is a video showing it in operation that we’ve placed below the break, and it’s tiny. We probably all consider ourselves to be quite good at soldering, but this piece of work is in another class entirely. The project was inspired by [Mike Harrison]’s previous holder of the smallest blinky prize, which used a PIC microcontroller atop a tiny surface mount supercapacitor. It uses the same capacitor for power, but we’d say it’s taken the blinky to new levels of tininess. Does this mean a new arms race is upon us in the world of tiny blinkies? We hope so, and though it’s difficult to imagine they can get much smaller we can’t wait to see what people come up with. If there’s one thing about our community it’s that saying something can’t be done is unwise: one of you will find a way if it is at all possible. Even Microchip’s MIC1555 might be a bit big though, so something inventive is called for. For a fascinating run-down of the state of the 555 art, read this article from our own [Ted Yapo]. Blame it on the falling costs of printed circuit boards, the increased accessibility of hardware design tools, the fact that GCC works on microcontrollers now, whatever the ‘maker movement’ is, or any one of a number of other factors. There’s a hardware demoscene now. Instead of poking bits, writing code, and dividing by zero to create impressive multimedia demonstrations on a computer, there is a small contingent of very creative people who are building their own physical hardware, just for the hell of it. They’re pushing boundaries of what can be done with hardware design, demonstrating manufacturing know-how, and turning a (small) profit while doing it. This is badgelife, the tiny subculture dedicated to creating custom electronic conference badges. For the last few months, I’ve been up to my neck in electronic conference badges. This year, I created the single most desirable badge at DEF CON. I also built a few Tindie badges, and right now I’m working on the logistics behind the Hackaday SuperConference badge. Sit tight on that last one — we’re doing something really, really special next month. Most badge projects are one-off production runs. This is to be expected from a piece of hardware that’s only meant to be distributed at a single event. The Tindie badge is different. It’s now a thing, and we’re building multiple badges for all the cons and conferences Hackaday and Tindie are attending for the rest of the year. This means I have the opportunity to do hardware revisions on the Tindie badge. Right now I’ve built three versions of the Tindie and we’ve distributed about two thousand of these kits at DEF CON, Maker Faire New York, and the Open Hardware Summit. After about two thousand units, I think we finally have this down. This is how I designed three versions of hardware in as many months and cut the BOM cost of each badge in half. This is bordering on a marginally impressive piece of engineering, and a great lesson on BOM cost optimization. [David] hand soldered a Blinky ball… and you can too! 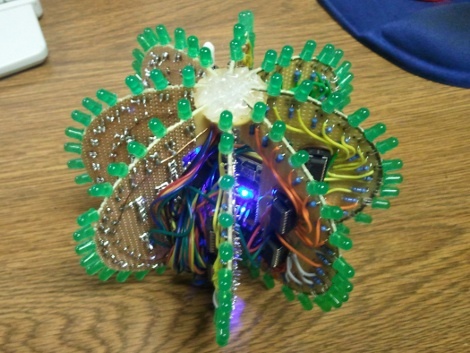 This is a blinky ball that [David] designed, built, and programmed himself. Does it look familiar? It should, he took his inspiration from the original prototype, and the Hackerspace-produced derivative. [David’s] version is not as small, or as blinky, but in our minds the development process is the real reason for building something like this. He took a great idea and figured out how he could pull it off while pushing his skill set, staying within his time and budget constraints. The project is powered by an Arduino nano which resides in the core of the ball. [David] used protoboard sourced locally for each of the slices, soldering green LEDs along the curved edges, and added shift registers to drive them. The ball is driven by a LiPo battery which can power it for about 45 minutes. You can see the animation designs he coded in the clip after the break. Over 2500 unique patterns and up to 25 hours of winky blinky fun, that’s what you get with Nodeblinky. This contraption was designed by the Image Node crew as a learning platform and a way to raise money for their upcoming Burning Man display. The kit measures 4″ square and has 28 LEDs spread across its surface. An AVR ATmega168, rechargeable 9 volt battery, and two LED drivers power it. One section of their site states that it has over 2500 unique patterns, while another area says 5000 combinations of patterns. Either way, its pretty trippy as you can see in the video above. There are 4 brightness levels as well as 4 running modes to keep you amused. The kit can be purchased for $40 or the assembled unit for $80. They do freely give out all the details though, so if you really felt like building one yourself, you probably could.